Karen M. Buckley will be giving a talk with Ellen Duffy on Thursday, September 28 entitled "Women & Divorce: What Financial Information Do I Need to Make Informed Decisions?" Click here for more information. Free Home Buying Class held at Diesel Cafe. 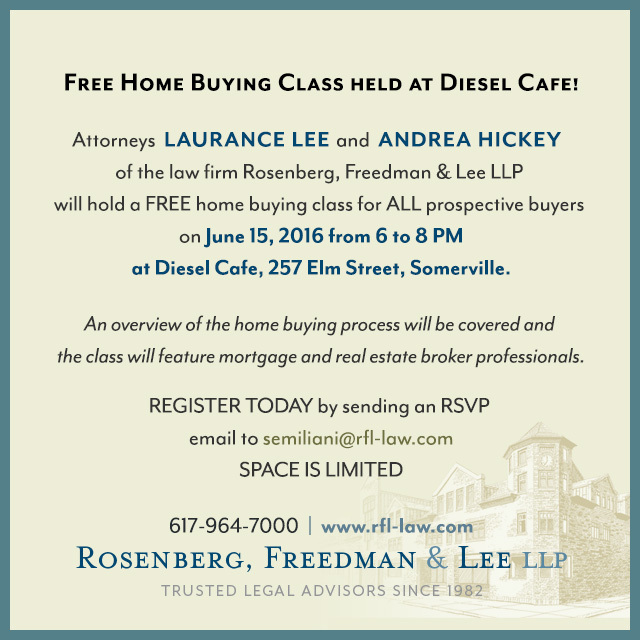 Attorneys Laurence Lee and Andrea Hickey will hold a free home buying class for all prospective buyers on June 15, 2016 at Diesel Cafe, 6 to 8pm. Click here for more information. RFL welcomes Attorney Andrea Hickey to the firm. Attorney Hickey is a partner with the Real Estate Group and is the Managing Attorney for the Cambridge Office. RFL welcomes Attorney Ashley Y. Aubuchon to the firm. Attorney Aubuchon is an associate with the Elder and Disability Law, and Estate Planning group. RFL welcomes Attorney Jacqueline Croteau to the firm. Attorney Croteau is an associate with the Elder and Disability Law Group. Rosenberg, Freedman & Lee LLP named in U.S. New & World Report's Best Law Firms 2016 publication as a Tier 1 firm in Boston for Elder Law! Karen Buckley became a member of the Greater Boston Family Law Inn of Court in May 2015. The Greater Boston Family Law Inn of Court offers membership to a limited number of Family Law attorneys in the Greater Boston area. The goal of the Inn is to improve the practice of Family Law in the Commonwealth of Massachusetts through peer guidance, civility and also growth as sophisticated practitioners. Karen Buckley is speaking at a public education program on September 12th sponsored by The Divorce Center entitled “Divorce Matters For You”, a four hour program with several divorce professionals that discusses legal, financial, and emotional aspects of divorce. Visit the Divorce Center website for registration and program information. Kristin Shirahama receives a Pro Bono Award from the Women's Bar Foundation for her volunteer work in support of the Foundation's Elder Law Project. Kristin Shirahama was elected to the position of President-Elect of the Women's Bar Association of Massachusetts (WBA) at the organization's annual meeting on March 27, 2015. Kristin has served on the Board of Directors of the WBA since 2009. The WBA is a professional association of attorneys and judges, with over 1,500 members across the state. The WBA is committed to achieving the full and equal participation of women in the legal profession and in a just society. Susan Levin featured on the cover of NAELA News. Click here to see the article. RFL welcomes Cathleen Falcione. Cathleen will be assisting our attorneys with probate administration and estate tax preparation. She has over 20 years experience in business accounting and working as a trust & estate paralegal. Prior to joining Rosenberg, Freedman & Lee LLP, Cathleen worked as a trust and estate paralegal for firms in Watertown, Boston and Quincy. Cathleen is a graduate of Bentley University with a B. S. in Business Education. RFL announces the retirement of Stephanie Kendall. Stephanie worked as the firm’s probate and trust administration paralegal for thirteen and a half years. We are going to miss her and we sincerely thank her for her dedicated service to the firm. RFL welcomes paralegal Melissa Hickey to the firm. She is a paralegal for the real estate group focusing on commercial and residential real estate conveyancing. RFL welcomes Attorney Peter Beebe to the firm. Attorney Beebe is an associate with the Probate and Trust Administration group. RFL welcomes Attorney Elizabeth Baum to the firm. Attorney Baum will serve as Of Counsel and will continue to focus her practice in providing legal and fiduciary services to incapacitated persons and elders. Don Freedman spoke on "Caring for Our Parents, Planning for Ourselves"